Sometimes it’s easy to get focused on the great things to do inside the park, and as a matter of fact, there are a lot of great things to do inside the park, but there are some great things just outside the park too. 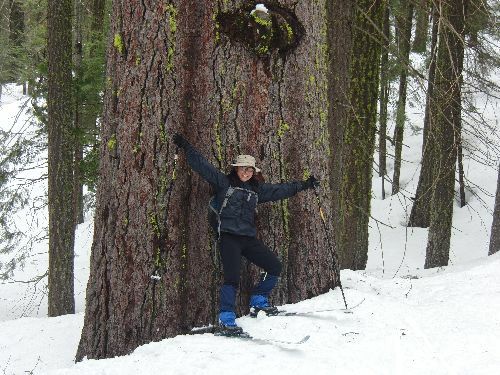 With Badger Pass Ski Area closed for the season, a small group of us thought we’d ski up the Mariposa Grove road and visit the giant sequoias. Fortunately, the road the the grove had been recently plowed in preparation for getting the road open to the public, so when we got there, there wasn’t really anything to ski on. Disappointed, we opted for an instantly improvised Plan B, which turned out to be so much better than Plan A. The transfer station just outside the park boundary isn’t a very auspicious trailhead, but there were several families there picnicking in the parking lot and playing on the snowbanks. We snapped on our XC skis and headed straight off into the woods guided by Tom’s unerring sense for fun, and it wasn’t long before we run right into blazes that looked suspiciously like trail markers along a nice wide road/trail, and then even trail signs with faded lettering and icons of XC skiers. Goal! 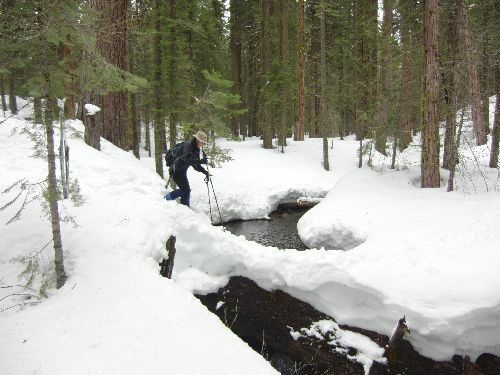 Now, we’d planned to ski the Mariposa Grove road, so we hadn’t brought a map or compass, but Bruce had this crazy idea that there was a road that cut over to the Giant Sequoias. Still, as we wound our way along this perfect little ski trail, we decided that we were probably going in exactly the wrong direction. 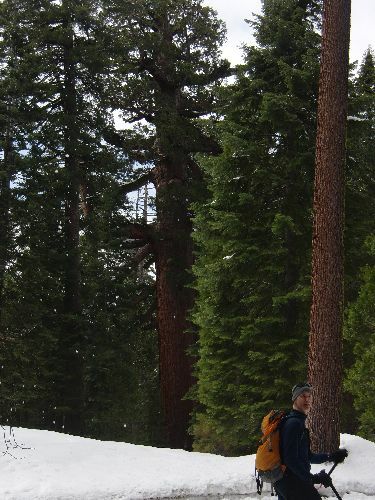 Then, as we approached our third set of trail signs, Tom, who had been the most convinced of us all that we were NOT going to see the big trees said, “Now, this is the sign that will say that it’s 1.5 miles to the Mariposa Grove.” And. It. Did! A sense of anticipation drove us on. I couldn’t wait to see those sequoias, and then just as we started feeling like we were getting close, a fast running creek blocked our way. Tom sure-footed and confident immediately found a way across, but both Bruce and I vetoed the crossing as being too sketchy, and we decided to ski upstream for a little while to see if we could find anything more reassuring. The next opportunity was an fat downed log lying across the creek. In the summer time this would have been an easy crossing, but with snow piled high on the log, the footing seemed less certain, more slippery and more likely to collapse or do other unexpected things. Also, it was high enough that I imagined a tumble before a head first splash into the freezing water below. Tom forged the way – kicking his feet carefully to test the snow beneath him. 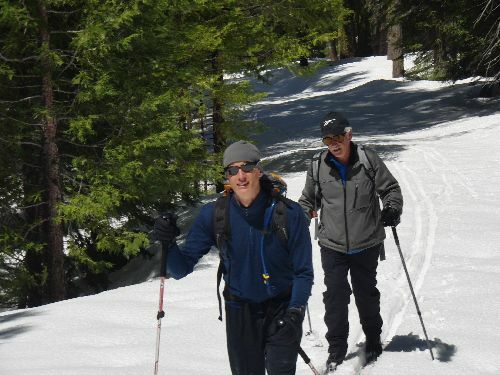 Bruce bravely carried his skis across, but I asked Tom to carry mine so I could focus on my footing. It went just fine. Easy even. Once that hurdle was crossed, we headed off again with excitement until we crested a small ridge and popped out just across the road from the Grizzly Giant. We had lunch, shared the view of the trees with a few people who’d walked up the road from the parking lot, and then even though there really is no place like the upper grove in winter, opted to ski back down our trail to continue the rest of our day, celebrating the whole while our extraordinary luck that the main road to the grove had been plowed. ← Which season is it?